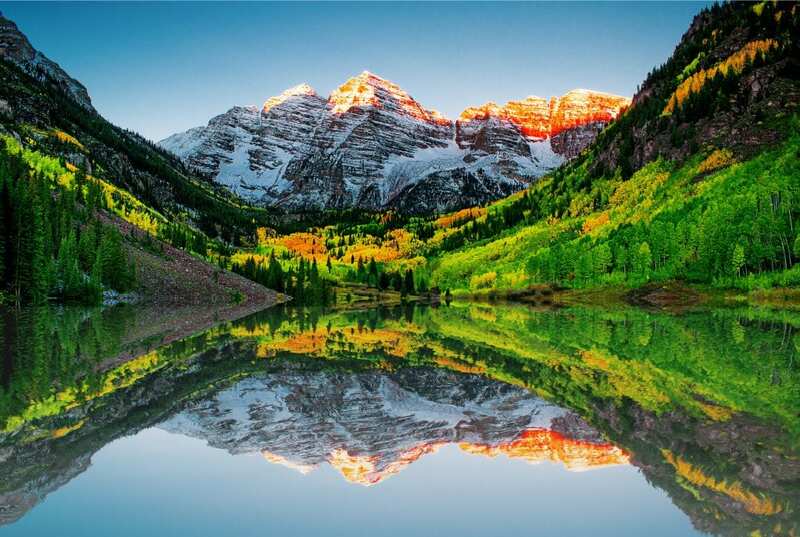 Sunrise at Maroon Bells Lake located in the White River National Forest. The 2015-16 ski season was another banner year for Colorado ski resorts. For the fourth season in-a-row, 23 Colorado ski resorts that operate on public land sent record-setting rent checks to Washington. The U.S. Forest Service and Bureau of Land Management in Colorado sent $25.6 million in revenue-based rent to the U.S. Treasury for the 2015-16 ski season. This is up more than 11 percent from the previous season. The payments are based on any transaction on federal land which include lift tickets, season pass sales and ski lessons. Colorado resorts have seen revenue-based rent payments climb more than 56 percent since 2012. All of the 23 resorts using public land sent their largest ever rent checks to the federal landlords in 2015-16. Five ski areas — Purgatory, Silverton Mountain, Aspen Highlands, Keystone, Ski Cooper and Eldora — saw their rent payments increase more than 20 percent over the 2014-15 ski season. The White River National Forest is the most visited national forest in the nation encompassing 2.3 million acres. With 11 ski resorts, eight Wilderness areas, 10 mountain peaks over 14,000 feet and 2,500 miles of trails. It sent $19.6 million to the nation’s capital, accounting for more than three-quarters of Colorado’s ski area rent. Vail Resorts — parent to Vail, Breckenridge, Beaver Creek and Keystone — paid the feds more than $15.4 million in fees. Purgatory Resort outside of Durango posted the largest year-over-year increase. They sent $273,211 (up 31 percent) in revenue-based fees to the San Juan National Forest for the 2015-16 season. A big reason for the increase was due to the new owner pumping more than $6 million into the resort. Purgatory added new runs, snowmaking and a high-speed quad chair. It was the largest one-time investment in the southern Colorado resort’s history. The 2015-16 season lured 13 million skier visits, an increase of more than 400,000 over the previous record. It was during this same season that ski resorts started stretching revenue opportunities beyond winter by adding summertime activities. The 2015-16 rent tally includes the first full season of summer operations at Vail, with the alpine coaster, adventure challenge courses and new trails. Travelers visiting resort towns spent more money than ever before in the in the 2015-16 season. Vail and Breckenridge, saw a decline in early-season visitation of the season but revenues climbed. The surging revenues is driving upgrades and reinvestment. Vail is planning lift replacements. Summer development plans are underway in Snowmass and Copper Mountain. Crested Butte and Telluride are planning sweeping upgrades and Breckenridge is finalizing development of significant zip lines and upgrades to the adventure park at the base of Peak 8. One thing’s for certain, the state’s $4.8 billion ski resort industry isn’t going anywhere – we expect to see it continue to grow and evolve!